The rest of the city seemed to stand still as the fire raged, with thousands of passerby watching from the streets below. Many were in tears, silently filming the scenes on smartphones and broadcasting them across the globe. Europe is full of historic structures that have been rebuilt following damage during both war and peacetime. But experts despaired that the loss to Notre Dame was incalculable and unrecoverable. Trump said in Monday afternoon remarks that “they don’t know what caused it. Paris’s Church of St. Sulpice was set on fire after midday mass last month. No one was injured. Police are investigating, but firefighters attributed the blaze to arson. The Music Video, pre recorded. Where will the Hunchback live? They'll rebuild it. Nothing to see here. Funny, though. This thing that withstood two world wars, several European wars, the plague, the revolutions... finally destroyed by neoliberalism and austerity measures. A few memes involving Varg are floating around on social media. That, and some hunchback of notre dame fan art. It really is a shame to hear about. Historic, iconic building, it has to mean a lot to people (you don't get a multi-million dollar renovation budget otherwise). I'd be pretty devastated if an icon of my home city were to be damaged so. But it's good news that the interior didn't suffer as much damage as it could've, not to mention nobody being killed despite the dramatic destruction, and this will hopefully increase awareness of decay in other structures worth preserving. 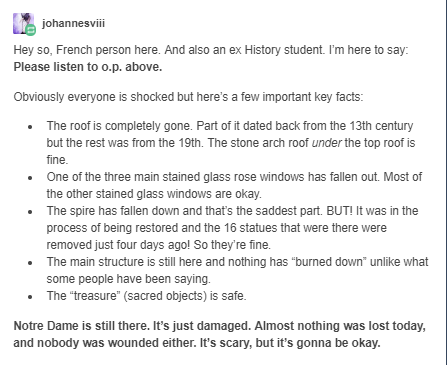 Sensationalism aside, it seems things are still looking good for Notre-Dame de Paris, even if the road's a bit longer than before. It's been through a lot more than this, and people have always cared enough to make it right again, even when lacking the tools we have today. Ehh. I get that you want to use this is a symbol for your convictions. But what caused the fire is not yet known, it is highly unlikely that it was arson, so given the fact that the part that caught fire first was under renovation, it was more likely than not some form of negligence. Which, let me tell you, knows no political colour whatsoever. OT: One of the most impressive cathedrals I have had the pleasure to visit, history around every corner. I hope they can restore it to its former glory. Kind of interesting to see one of the most important monuments of Europe burn several weeks before identitarian groups are running in the EU elections to wreck the EU. Dutch media even headlined with "the whole soul of France is in the Notre-Dame." Sounds like something an identitarian right winger would be called out for as being racist. When something monumental burns down suddenly there is such a thing as "the soul of france". Kind of interesting. I was just six when my parents took me to paris to visit this place. I don't remember that much but I have shades of good memories. Oh and a bad one as well (a bird shat on my hat.) Hopefully it's still beautiful. so given the fact that the part that caught fire first was under renovation, it was more likely than not some form of negligence. Which, let me tell you, knows no political colour whatsoever. I'm positive it was negligence. Thing is, France has been skimping on money for conservation/renovation efforts ever since this wave of austerity began. You know these kinds of budgets are the first to get slashed. Same deal happened in Brazil, where due to incredible budget cuts for conversation, we had our most famous museum burn to the ground since it was severely underfunded. One of my elder neighbors said that the fire was at the sistine chapel were the The Creation of Adam was when I asked him him if that was the Cathedral were man touches gods hand (The Creation of Adam) painting was at!.. That would of been a huge tragedy if that was the case!.. Truly shocking news. Thankfully, most of the structure, the famous twin towers and the bulk of the enclosing walls appear to be intact. Regretfully the ancient beam structure supporting the roof has been destroyed, along with the reconstructed 19th century spire. A massive shock for France and the French people. Pretty sure he could also walk on water. 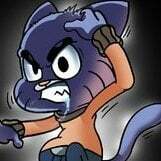 emma macron mentioned the creation of a kitty to finance the rebuilding of the cathedral, I'm sure that douchebag won't hesitate to explain in the meanwhile that the disappearance of the taxation on the wealth is a good thing for people. Why the hell does this kind of event never hit the MEDEF or the Racist Nazi instead? A gang of smoking ducks was seen flying over the Notre dame, one dropped their cig on the roof moments before it catched fire. Duck hunt is about to open. Looks like Assassin's Creed Unity finally did some good.